Betty at the start of Hostile Infrastructure as Jota observes. Arie, Alessandra, Joe and Bruno painting the outside of Hostile Infrastructure. Bruno in front of Hostile Infrastructure at Testing Grounds. Bruno Taking a photo of the RMIT students doing a final inspection of their work. 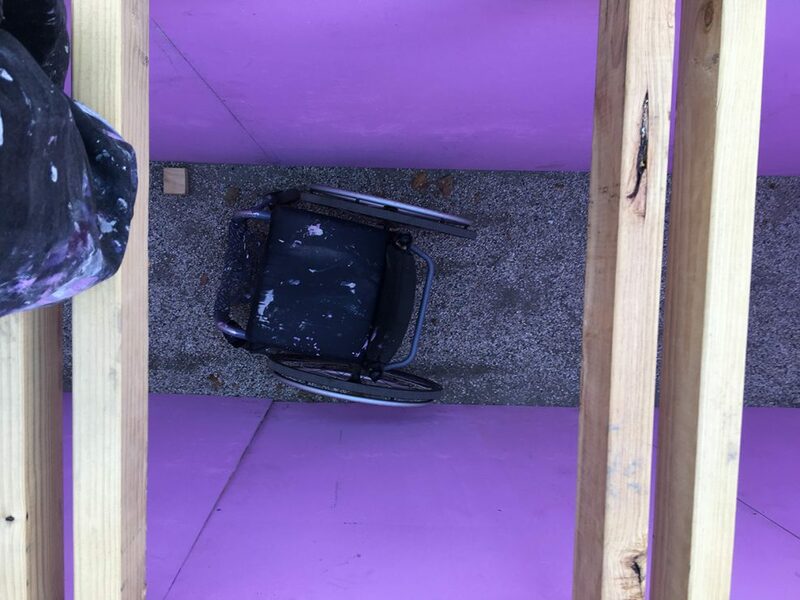 Bruno’s wheelchair shot by the artist from the top of Hostile Infrastructure. 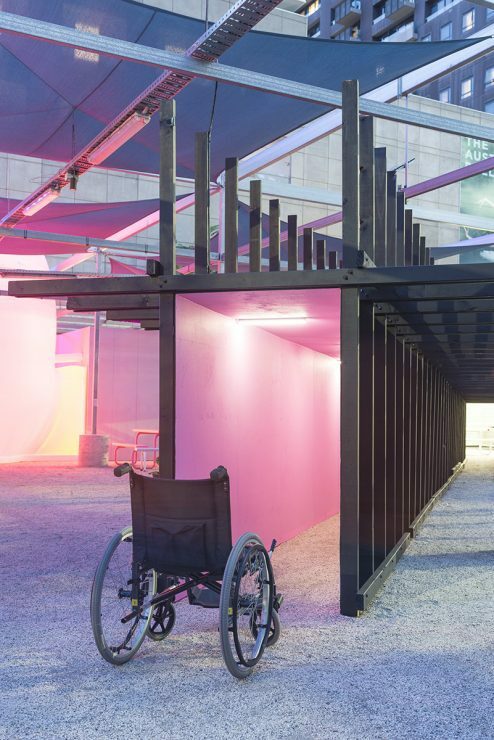 Bruno Booth, Hostile Infrastructure, Testing Grounds, 2019. Jota Testing Hostile Infrastructure as Betty observes. Max Richards taking a break from cladding Hostile Infrastructure. Max Richards testing Hostile Infrastructure. 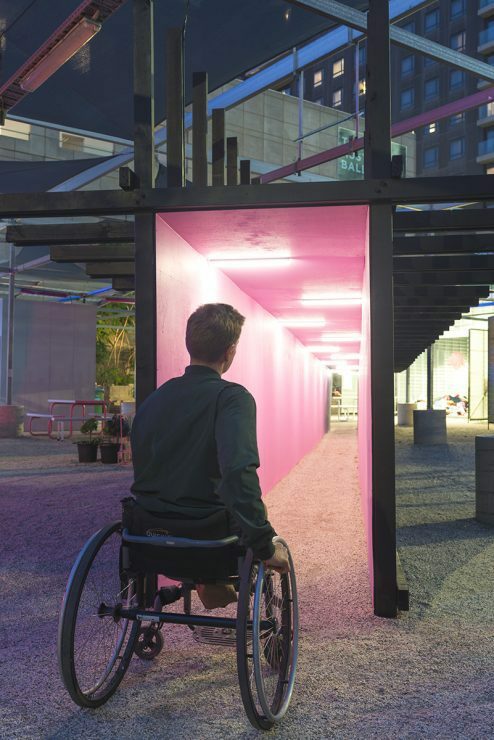 Bruno Booth is a Fremantle-based artist whose work centres around issues of accessibility within our society. Booth is a wheelchair user and represents his experiences through his work, which are often participatory in nature. Booth initially started out as a painter before branching out into his current multidisciplinary practice which also includes sculpture and installation. Booth’s latest work is the installation Hostile Infrastructure, created with the idea of showing what navigating day-to-day life is like for someone who uses a wheelchair. 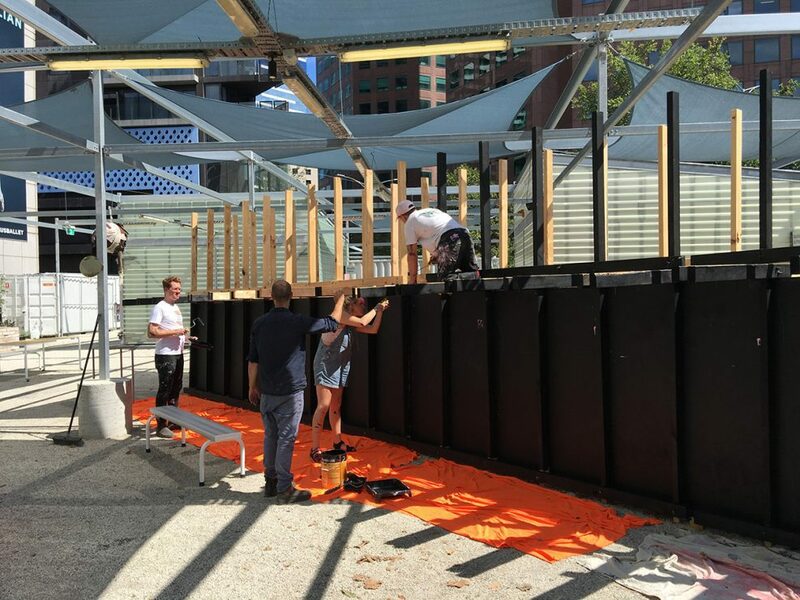 The infrastructure in question is an approximately 20-metre-long enclosed tunnel situated in the middle of Testing Grounds, an open-air venue dedicated to supporting experimental, interdisciplinary art practices in Melbourne’s Southbank. Booth’s tunnel is nondescript and plain black when viewed from the side, but painted bright pink on the inside. 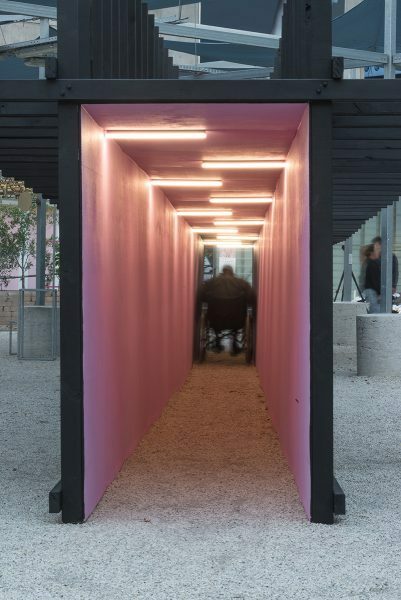 The tunnel is fitted with intermittently flickering neon lighting. It’s bright daylight when I visit, so the faint flickering doesn’t disorient or bother me as much as it probably would if viewed in the evening darkness. As a structure, the tunnel is a relatively simple one. But despite that, Booth’s Hostile Infrastructure proves to be tricky to navigate. The tunnel has been built without any flooring and placed directly on the gravelled surface at Testing Grounds, among shipping containers that double as artist studios. 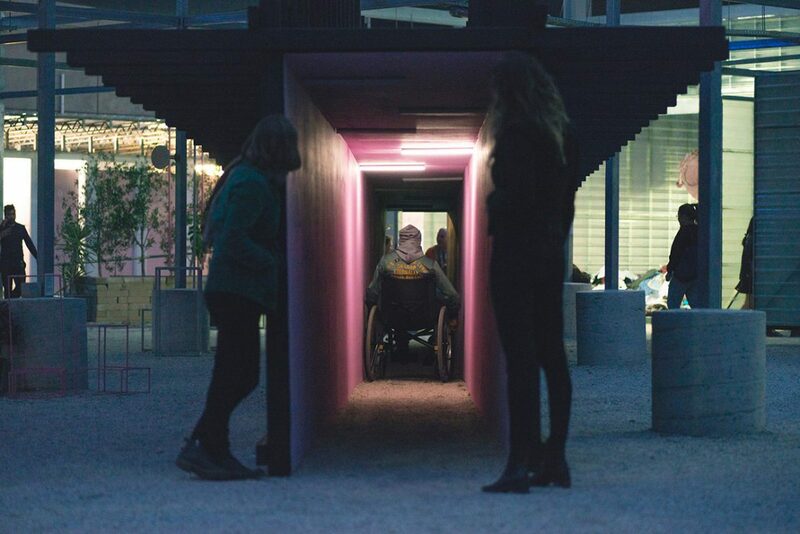 At one end of the tunnel – clearly marked as the starting point – is a manual wheelchair. 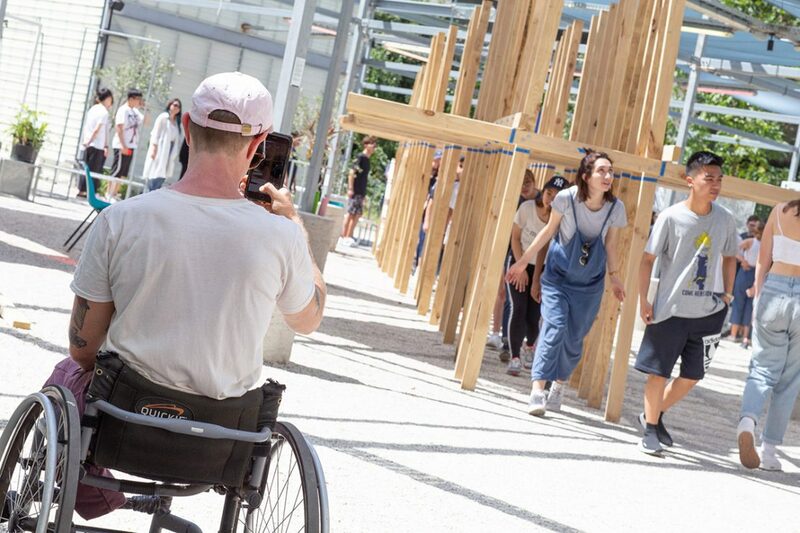 To experience the work as the artist intended you should really make your way through the narrow corridor using the wheelchair. 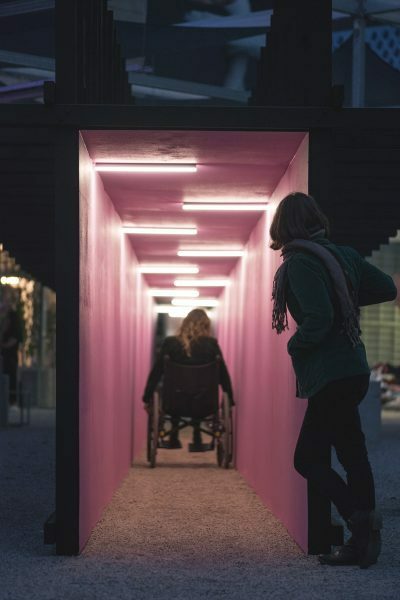 No one is stopping you from walking through the tunnel, of course, but it would certainly diminish the intended effect. From the outside, the corridor appears to be straight, equal in width throughout. 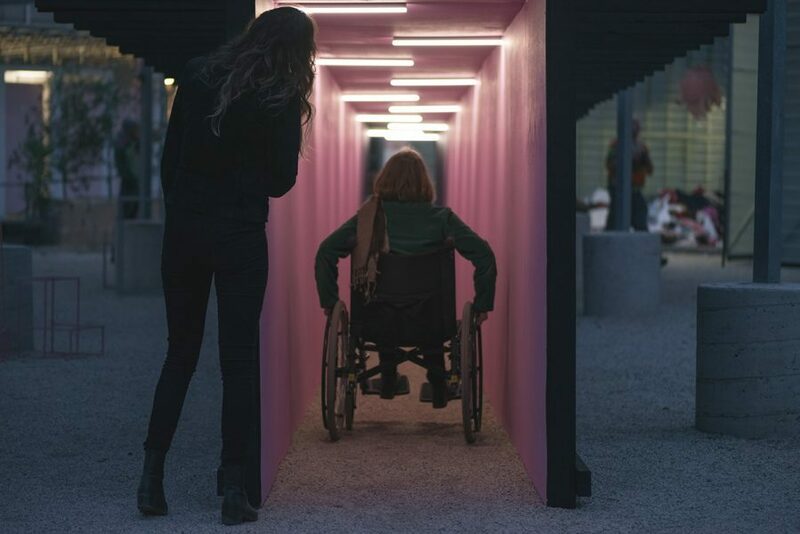 But slowly inching through the tunnel in the wheelchair, it becomes evident about three-quarters of the way through that this is not the case. Somewhere towards the end I get stuck, knuckles grazing the walls, fingers jammed between the wheels and the rough tunnel surface. 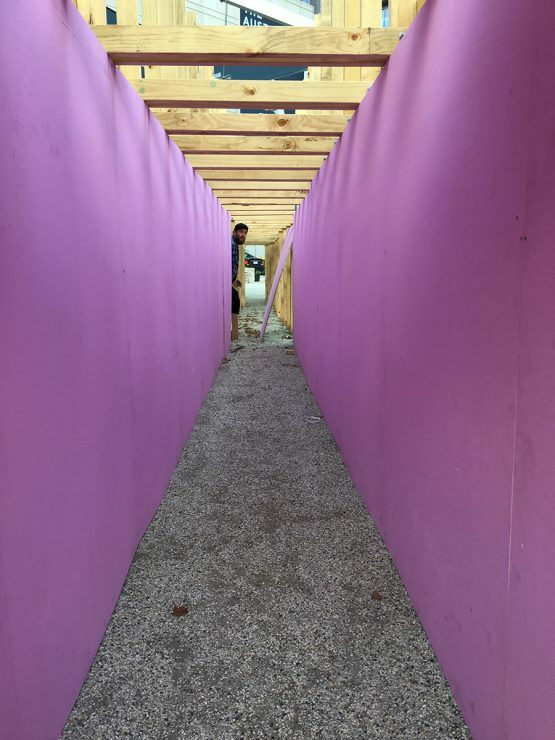 The bright pink walls of the tunnel progress to a deeper purple until finally turning a dark blue. The scuff marks against the blue paint at the end are very obvious, and suddenly I don’t feel too bad about getting stuck. There’s a slight relief in realising that I’m not the only one. But this relief doesn’t last very long when it dawns on me that the only way out of the tunnel is to awkwardly wheel myself out backwards, because there’s no way I could manoeuvre myself out to exit the tunnel. I feel a little embarrassed, but then feel a little guilty. I think about how many times this must happen to someone using a wheelchair, and then move on to thinking about our trams and tram stops. It’s not long before I get carried away worrying about accessibility, city planning, and beyond. And then I think, Bruno Booth’s Hostile Infrastructure has done its job. A master of optical illusion, M.C. 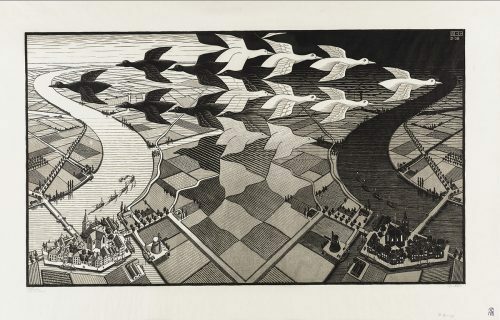 Escher (1898–1972) was known for his mathematically inspired prints, which explore perspective, reflection, symmetry and tessellation. 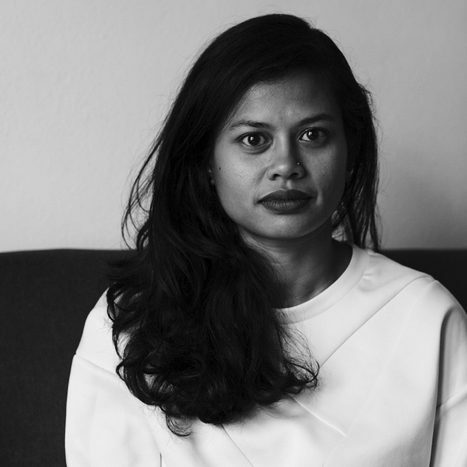 Slipping between questions of constructed identity and culture, the agenda proposed by South/East Interference Vol. 2 is a bold and critical one.